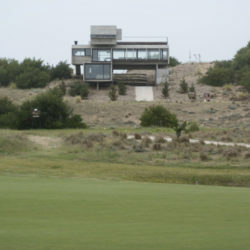 Golf House is geographically located at the center of Costa Esmeralda, a neighborhood 13 km north of the seaside resort of Pinamar. 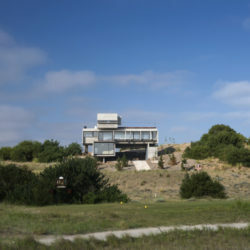 Topographically lying on highest area of the neighborhood, both the front and the back of the plot of land adjoin a golf court that, along with the —mainly wild— native vegetation, compose its immediate surroundings. 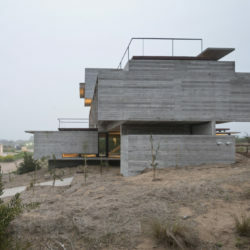 Originally, the plot of land was circumscribed by a virgin dune, the slope of which grew in height away from the street, and that the Studio proposed to preserve. 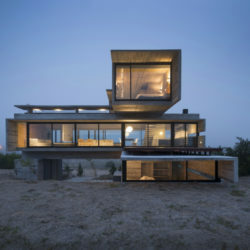 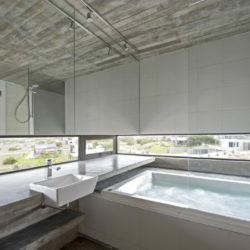 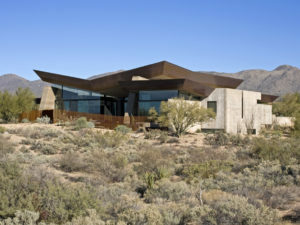 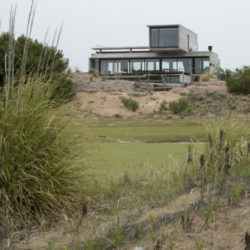 The commission consisted of a vacation home that could be inhabited throughout all four seasons of the year and that required little maintenance. 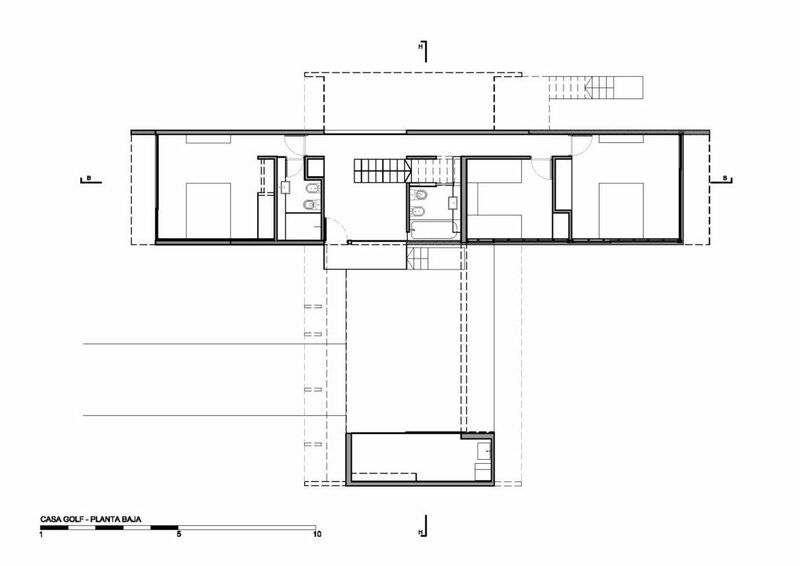 The brief called for three secondary bedrooms (two sharing an external bathroom and an ensuite one), and a master bedroom, completely independent of the others, served by another bathroom and in open relation with a space that could be used both as a private living room and a painting atelier. 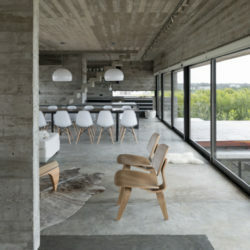 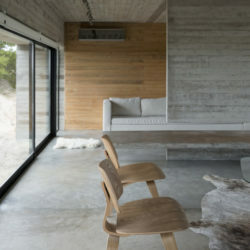 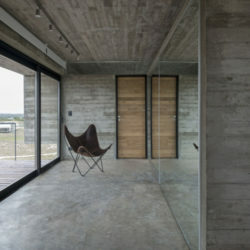 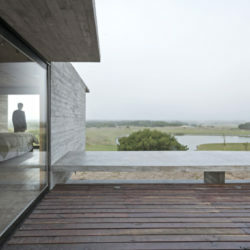 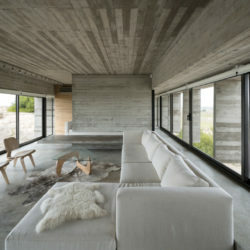 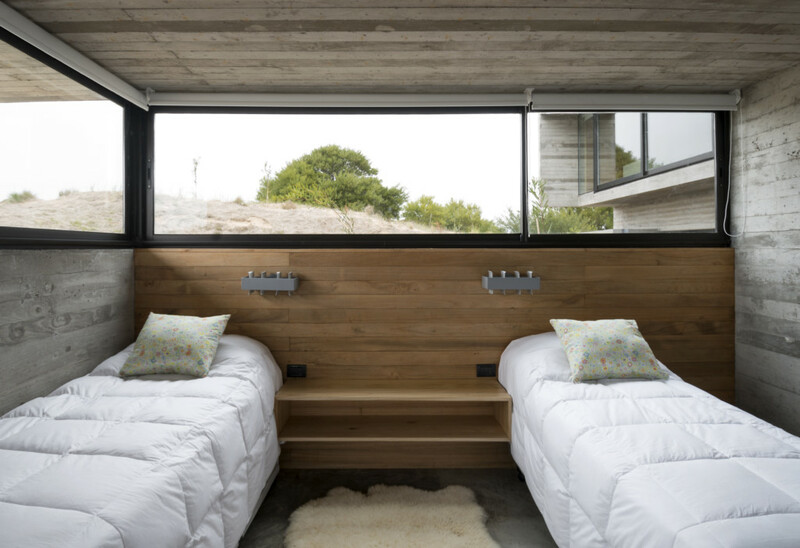 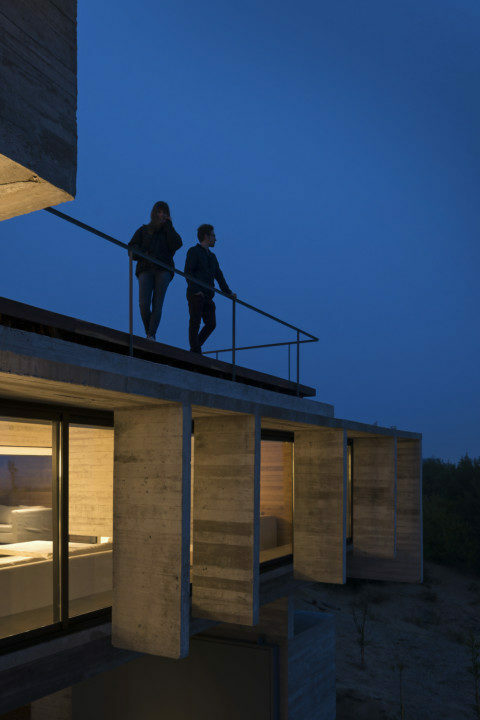 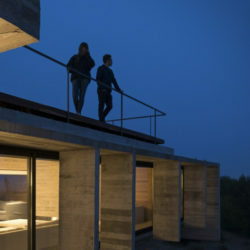 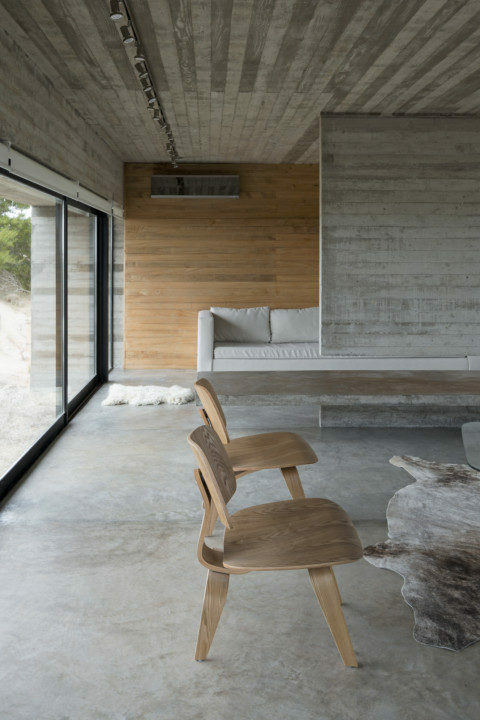 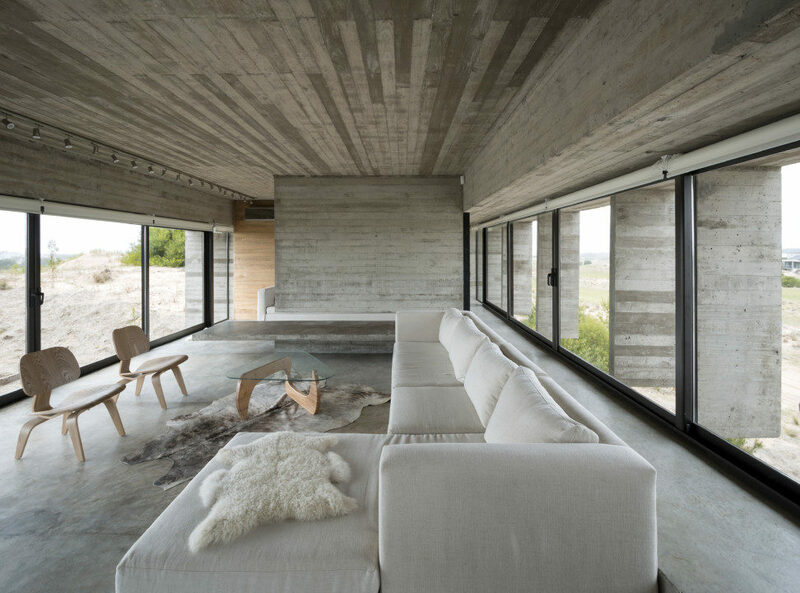 The couple’s area should be a tranquil shelter, visually connected with its natural environment and closely related to an outdoor extension. 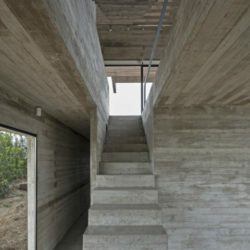 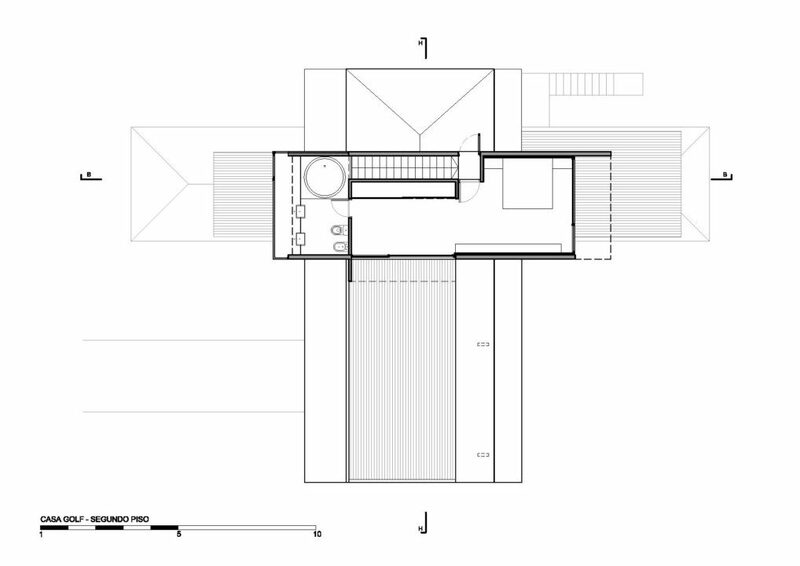 This area of the house, along with the communal social spaces should play the leading roles in the house. 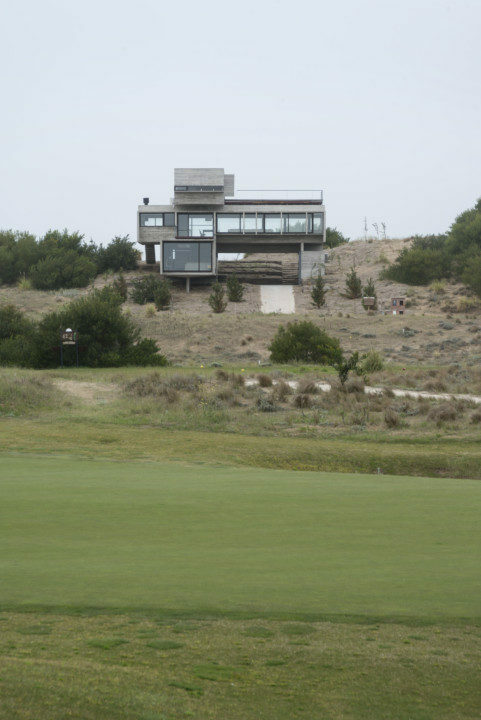 Also, it was stated that the native vegetation should be preserved and the breathtaking views maximized. 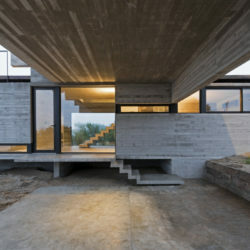 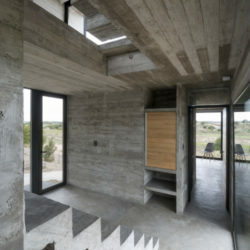 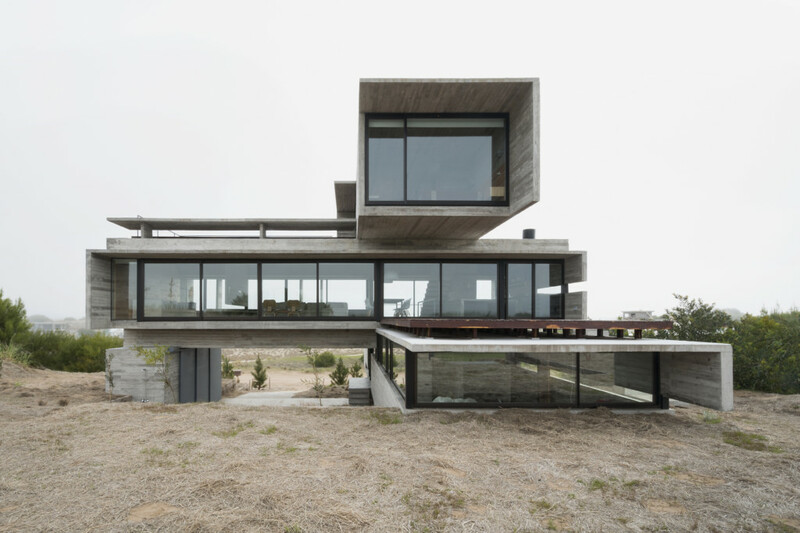 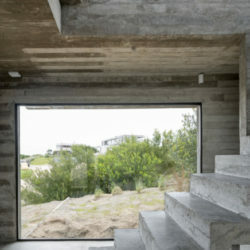 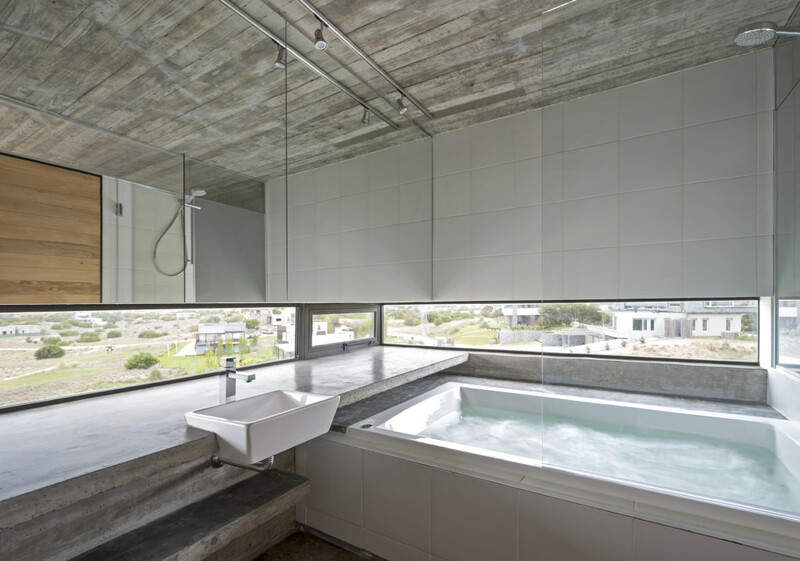 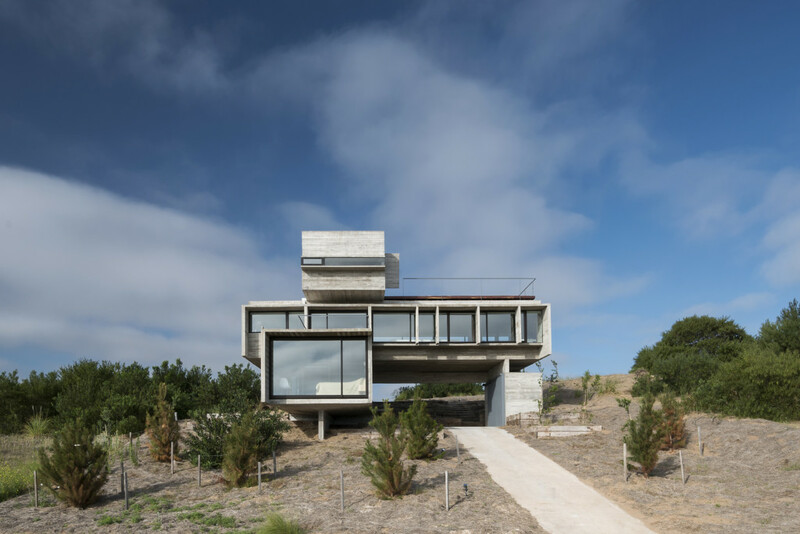 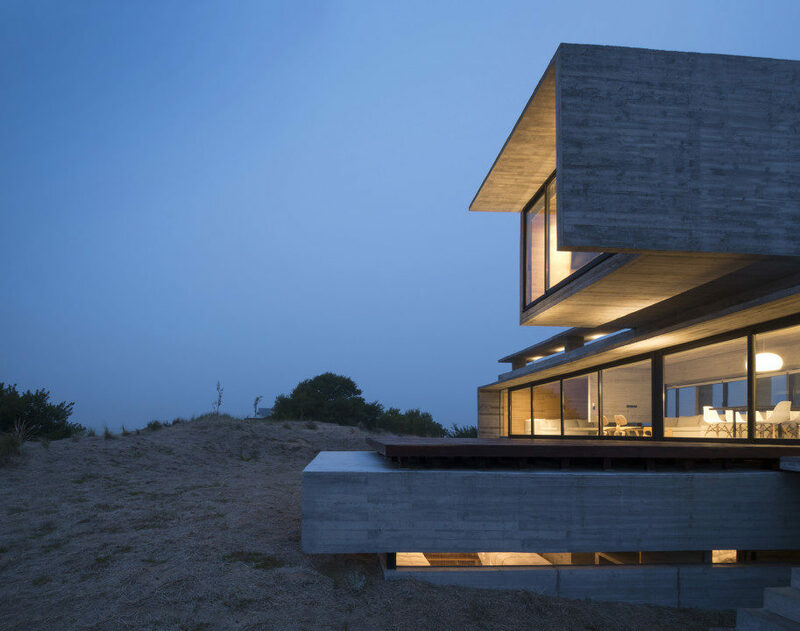 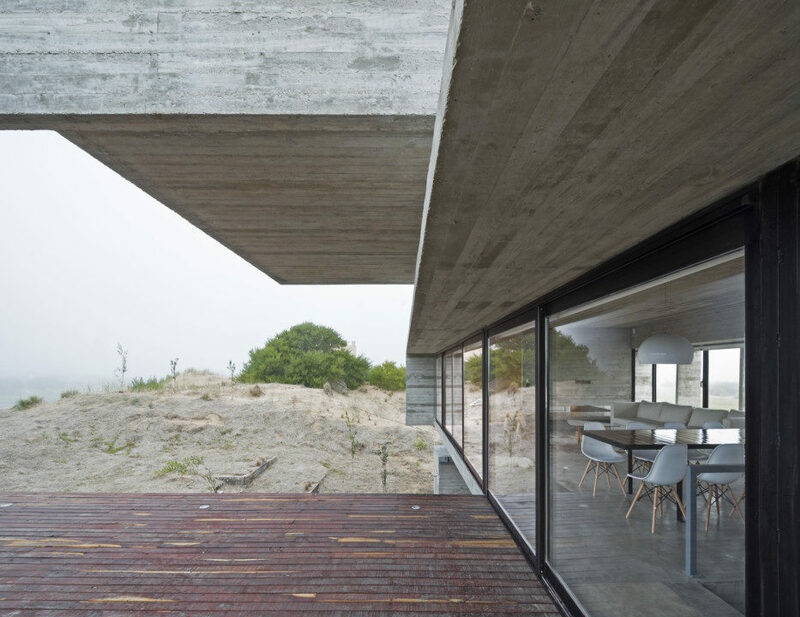 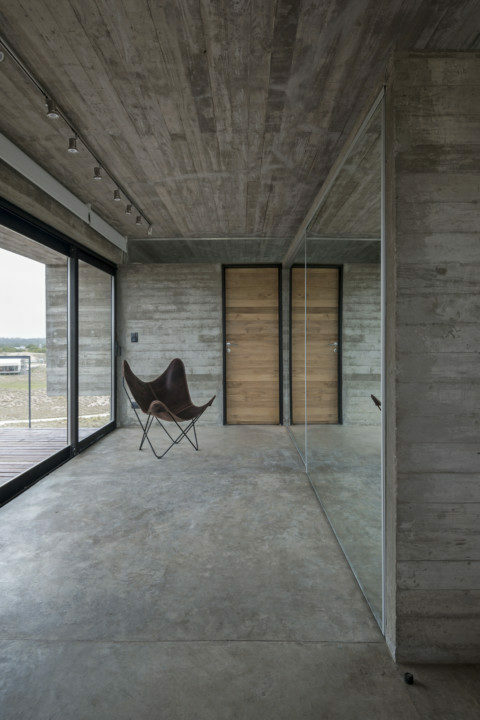 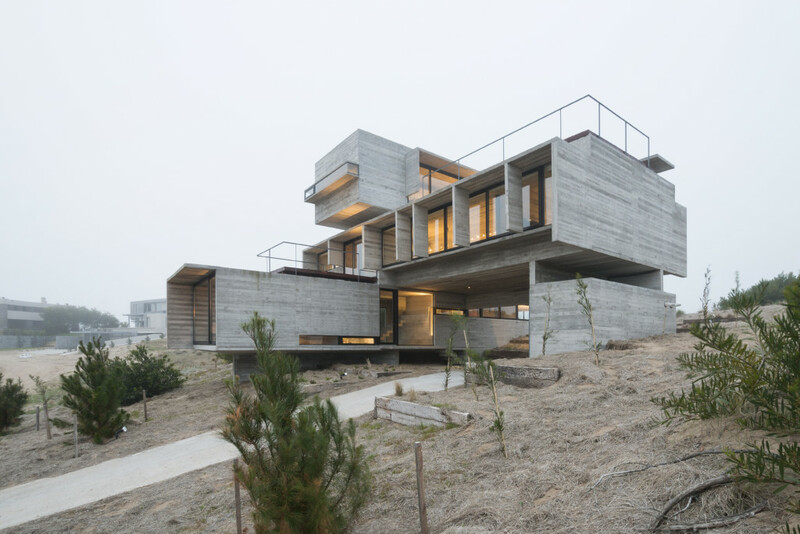 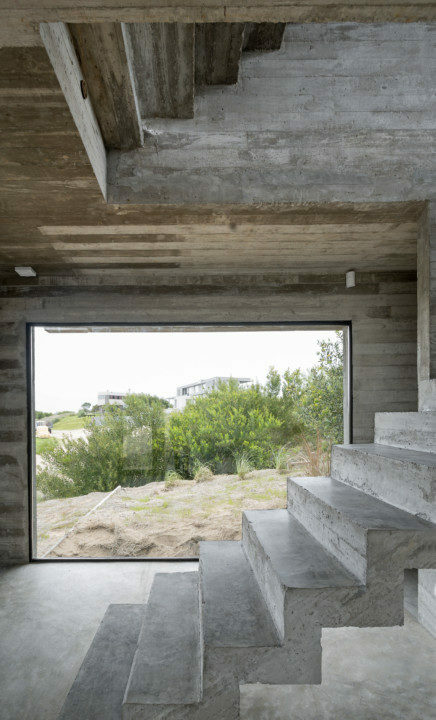 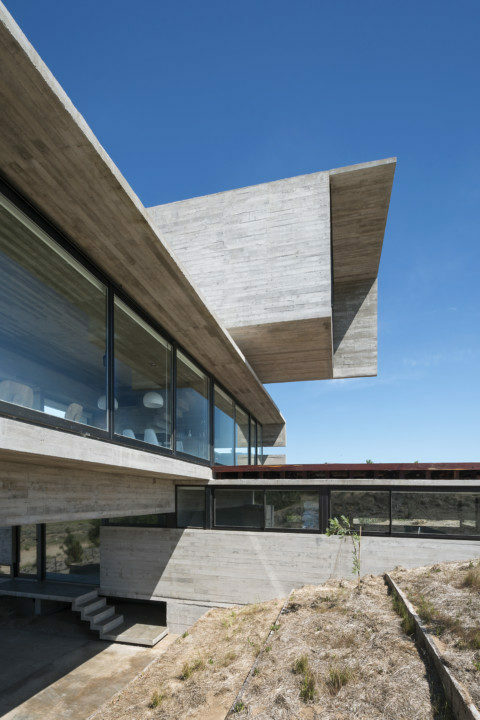 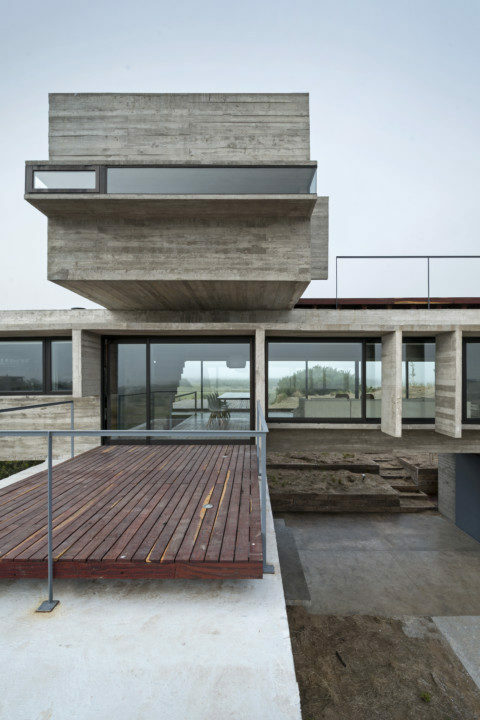 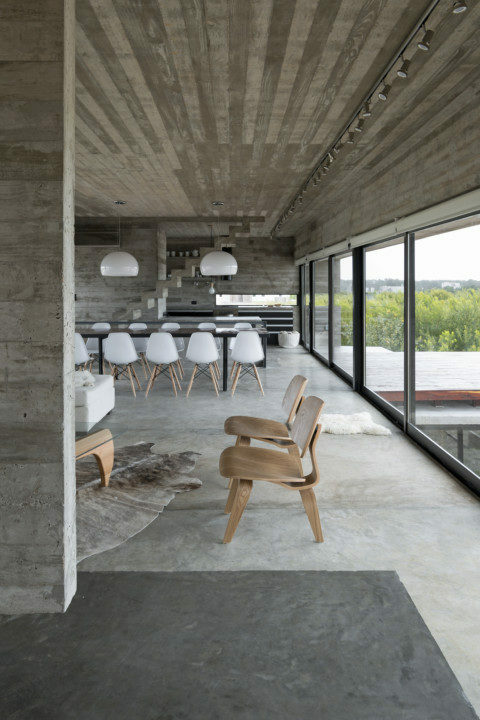 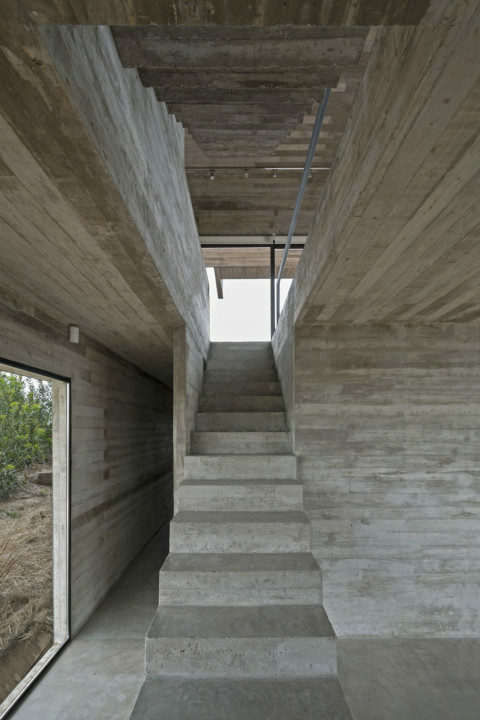 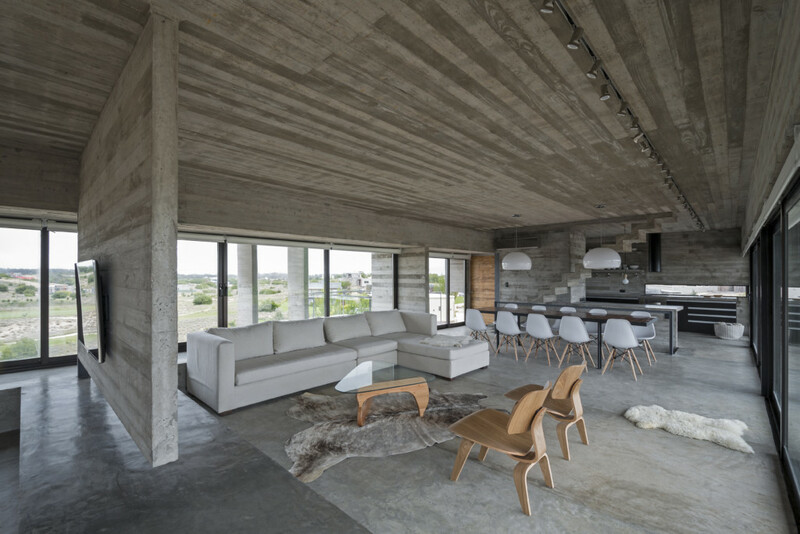 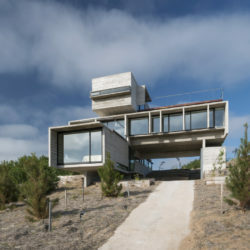 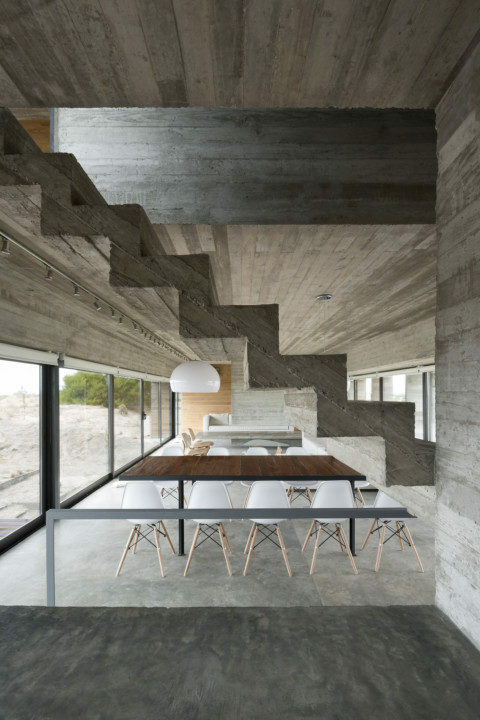 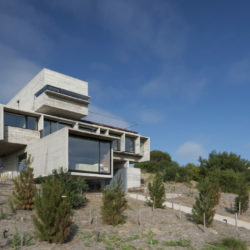 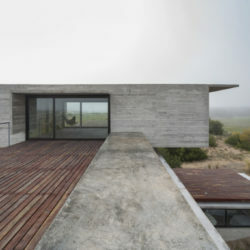 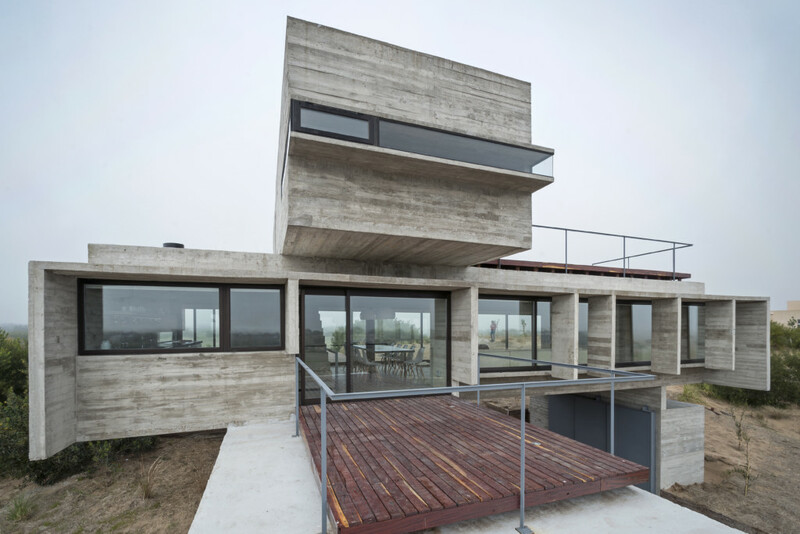 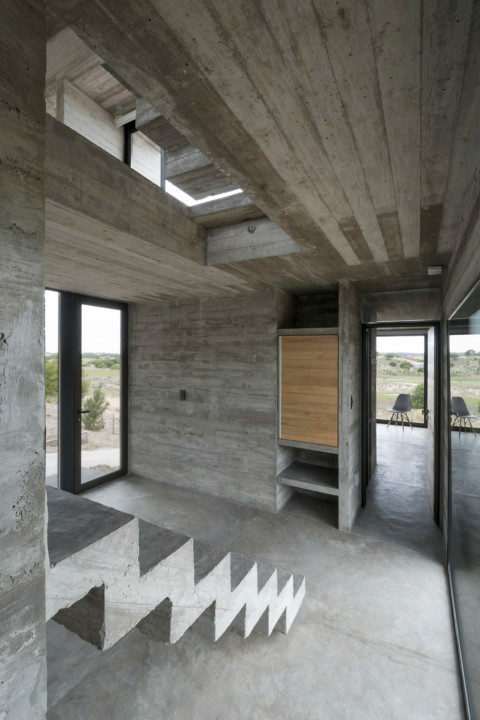 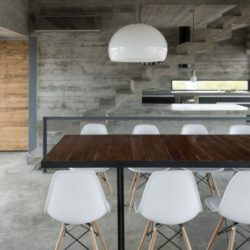 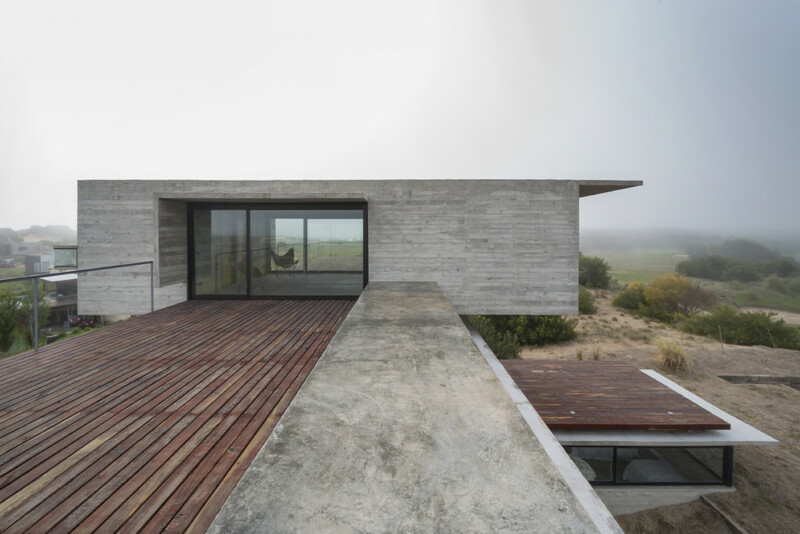 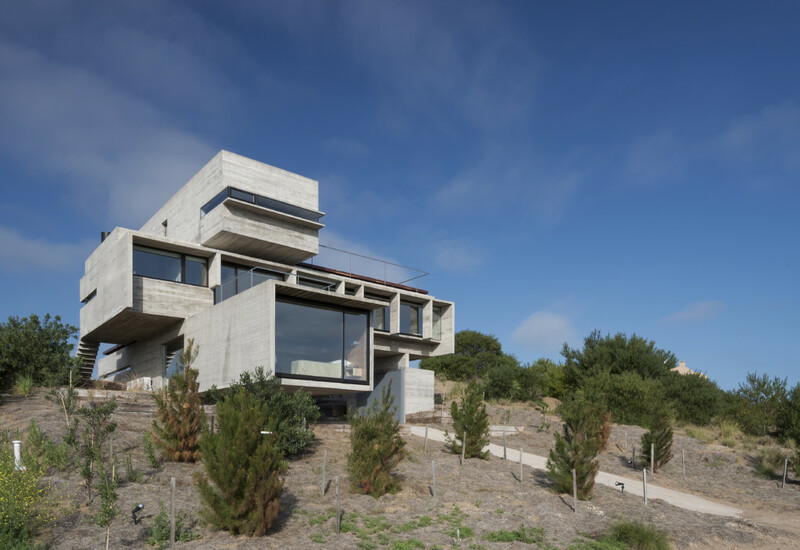 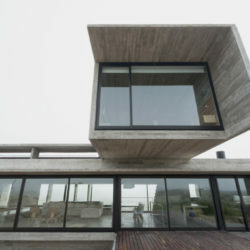 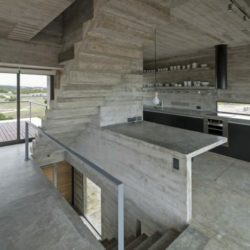 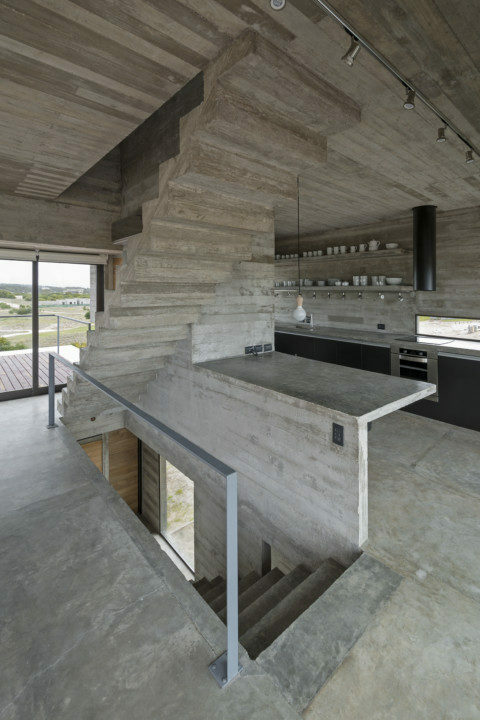 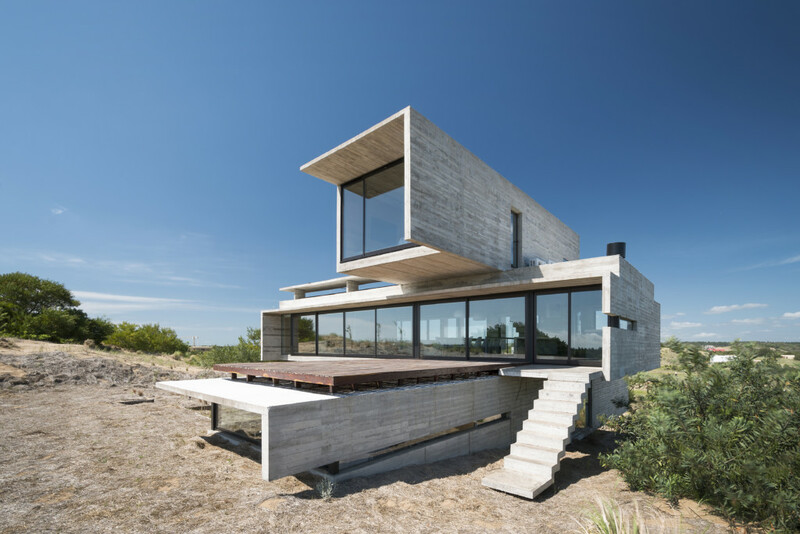 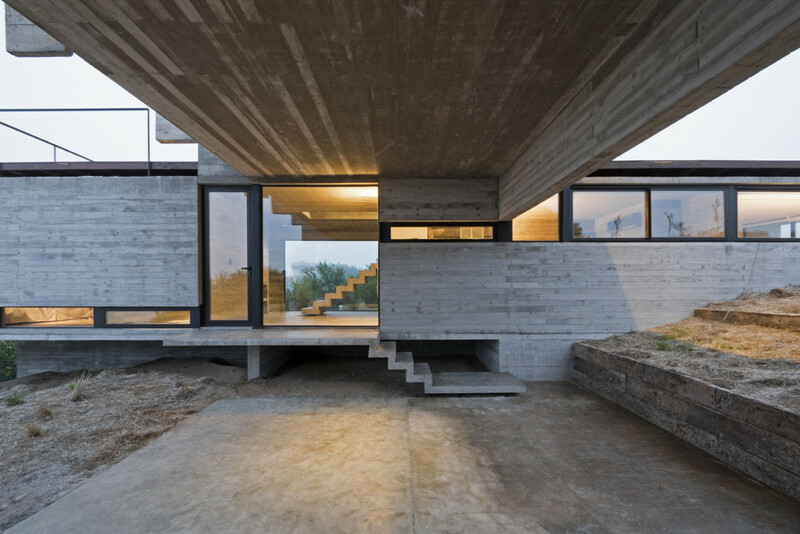 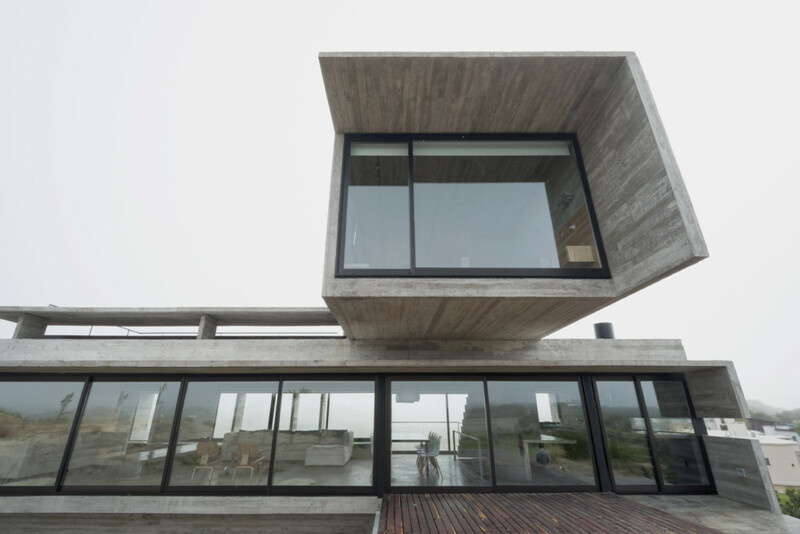 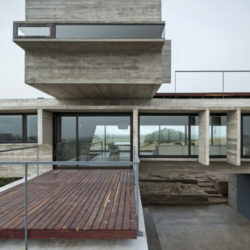 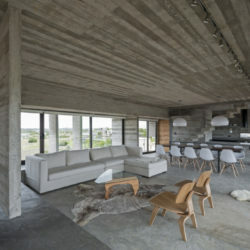 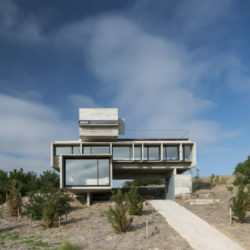 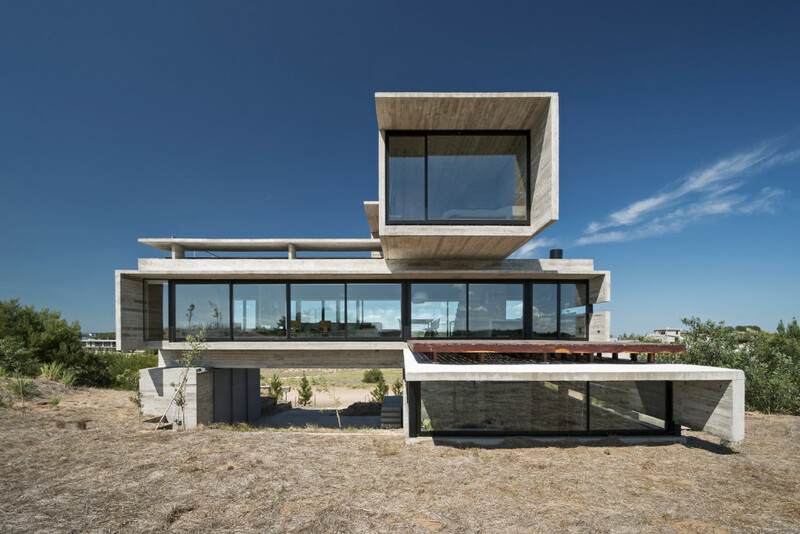 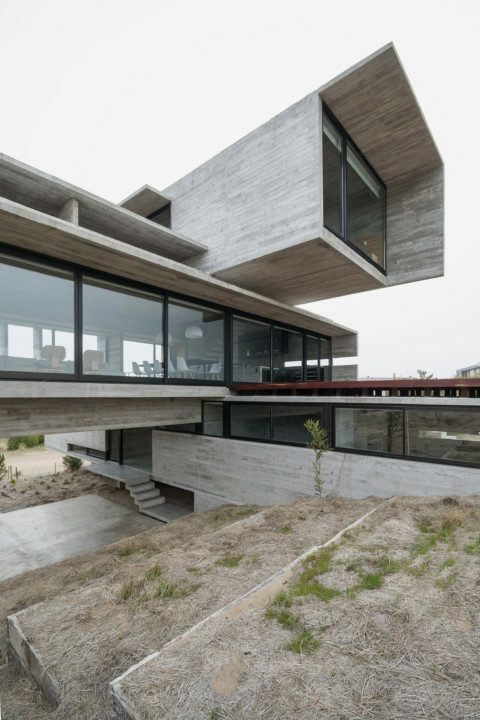 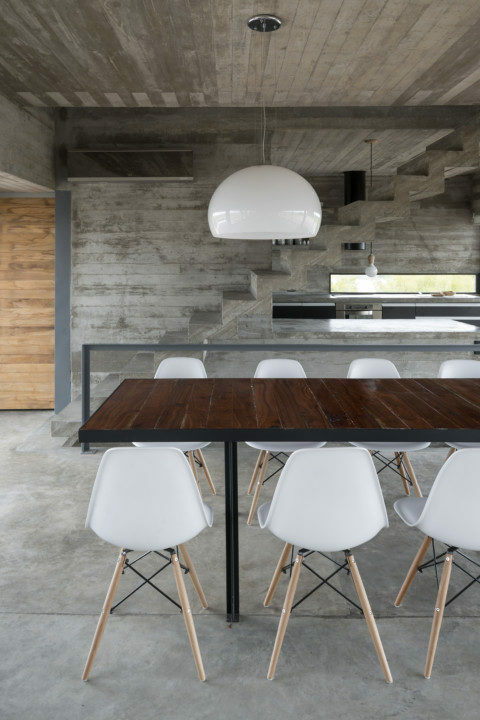 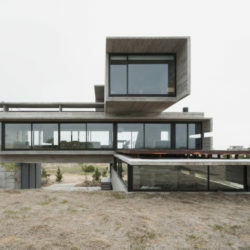 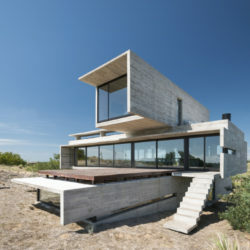 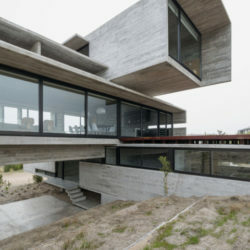 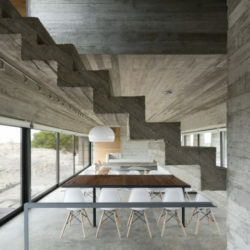 The Studio proposed a house entirely materialized in exposed concrete, whose noble esthetic expression allows a respectful dialogue with its surroundings. 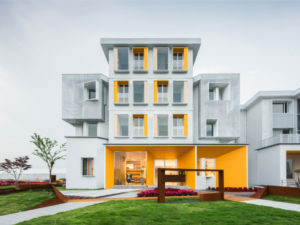 The architectural strategy aimed at organizing the different functional requirements distinctly grouped in three pure volumes oriented independently of one another and set at different levels. 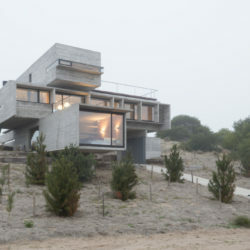 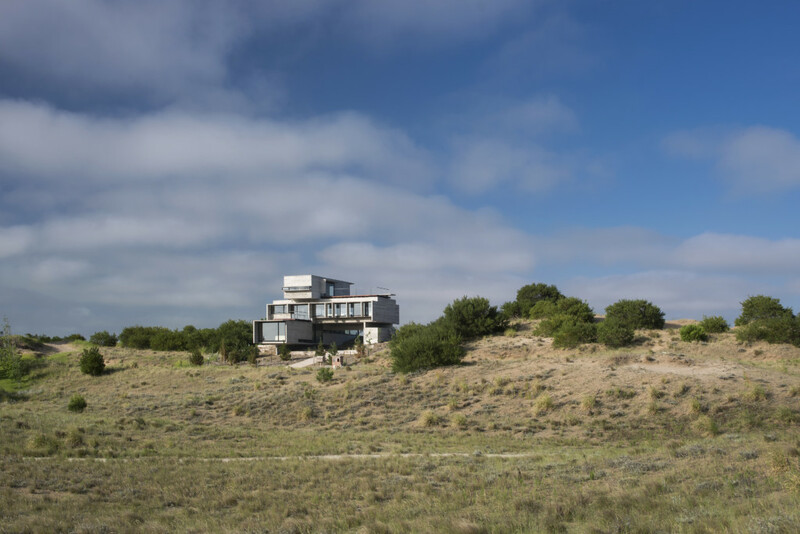 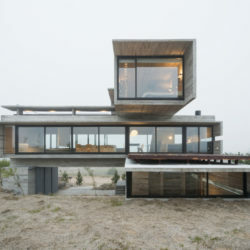 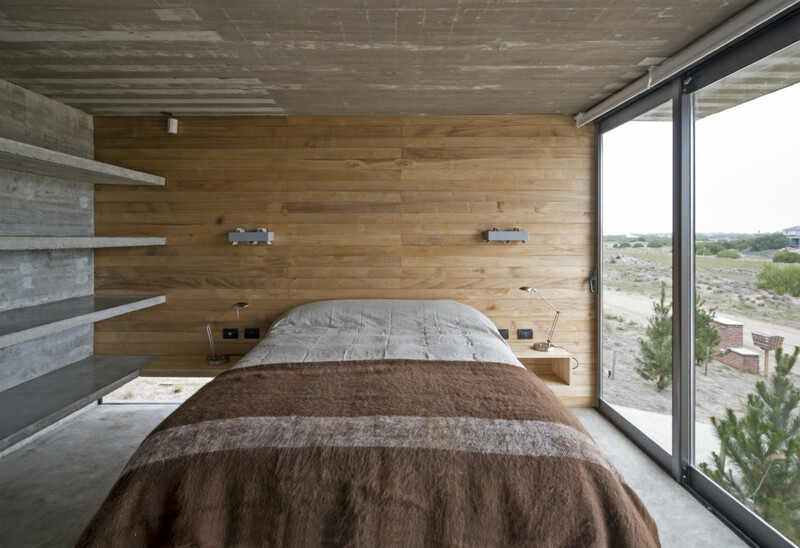 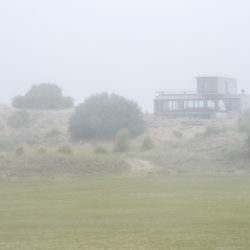 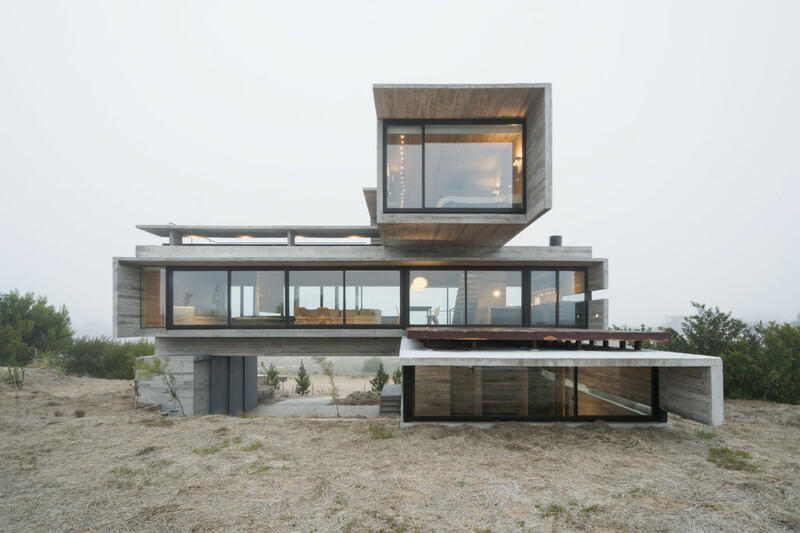 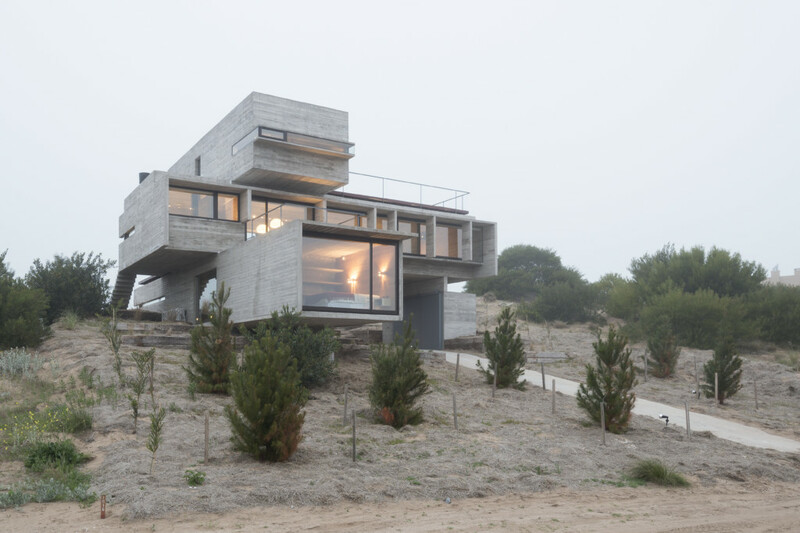 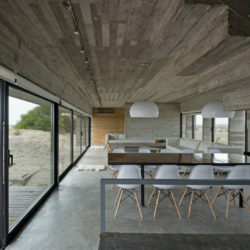 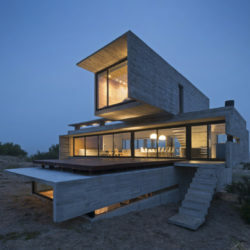 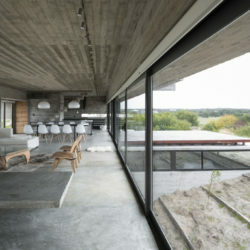 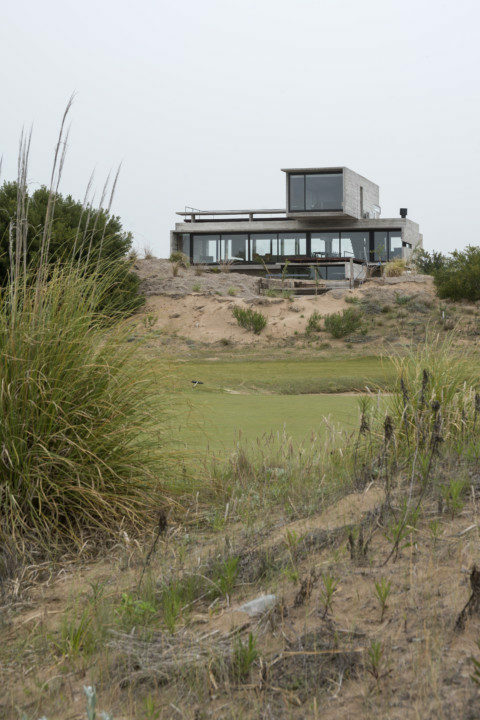 With its back half buried under the dune, the lower volume lodges the entrance lobby and the secondary bedrooms. 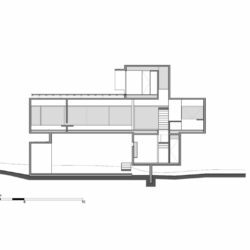 Along with a cube standing opposite —serving as a warehouse—, it supports the prism destined to house the dynamics of the family’s activities. 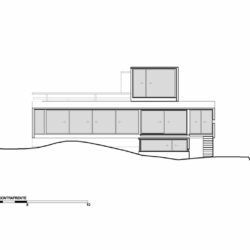 Containing the master bedroom, the third volume stands at maximum height, thus satisfying the client’s requirement of privacy. 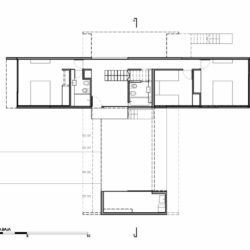 Regarding the general project, it aimed at exploiting the views, and at the same time avoiding a loss of the necessary preservation of the rooms’ intimacy, which is a characteristic challenge of contemporary glazed architecture. 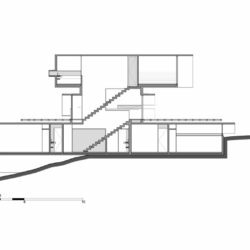 The volume housing the social areas is the most visually permeable one, not just due to the transparency of its skin, but also due to its being parallel to the street (contrary to the other two, that were set perpendicularly) and falling back into the lot. 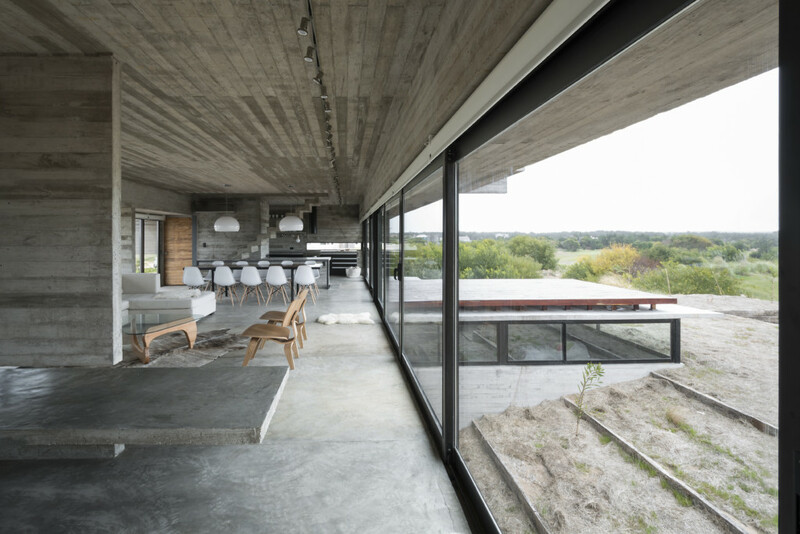 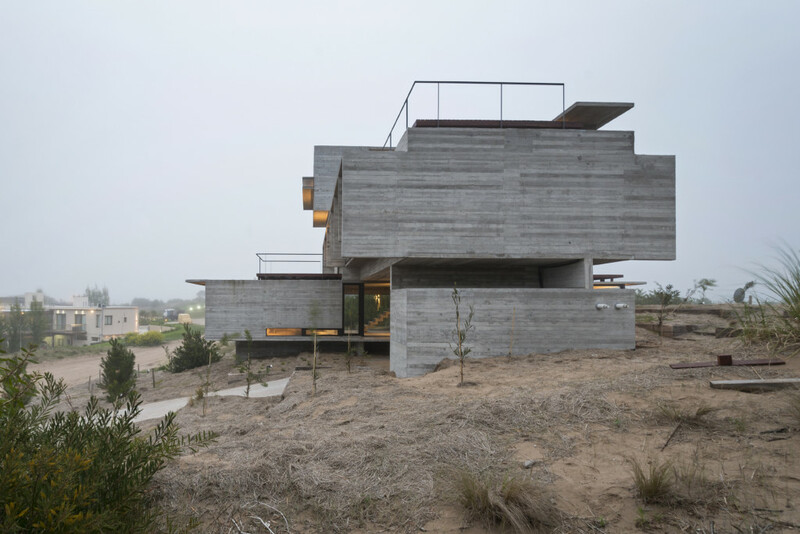 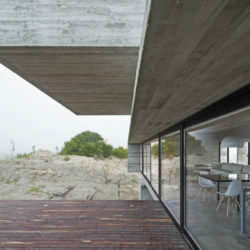 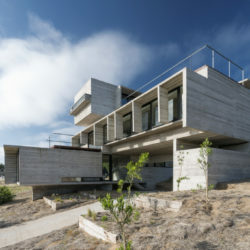 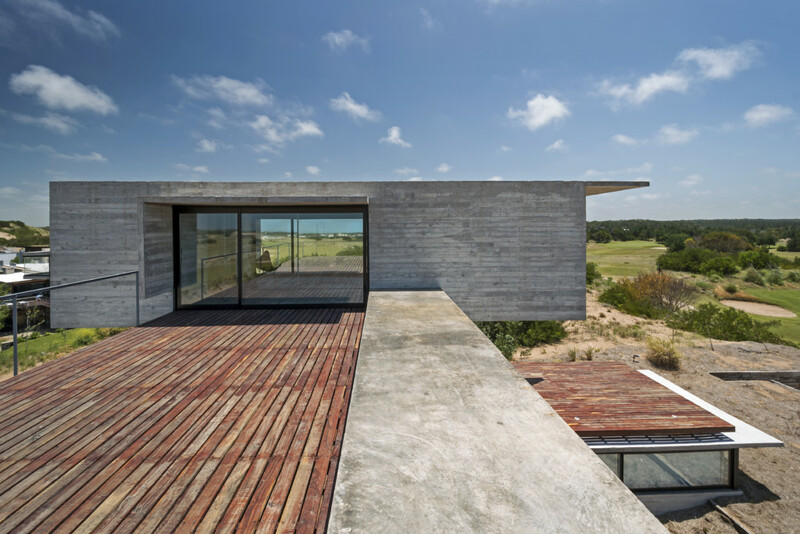 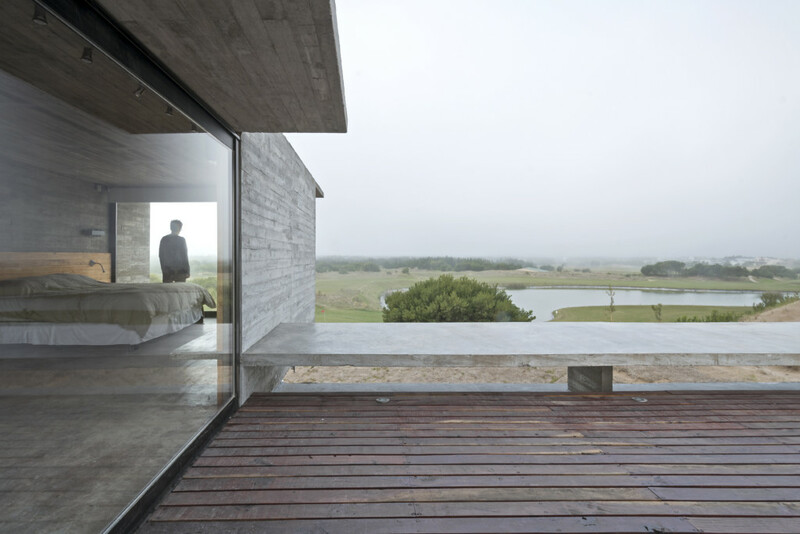 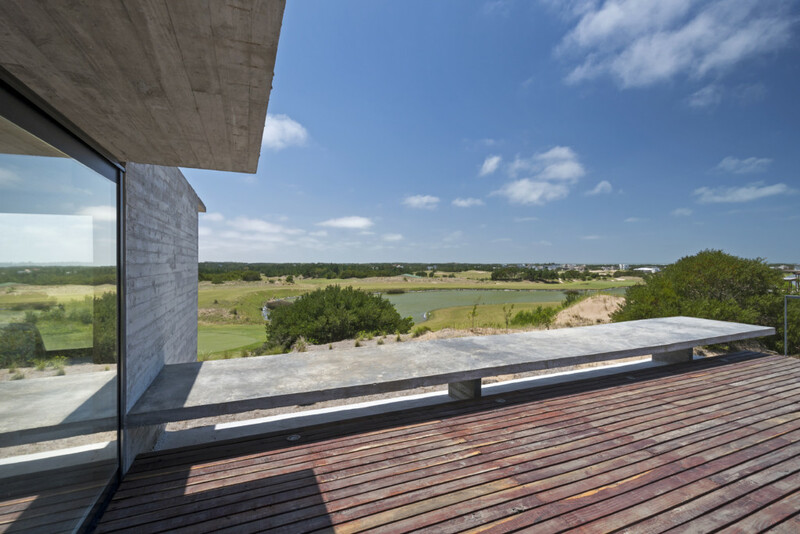 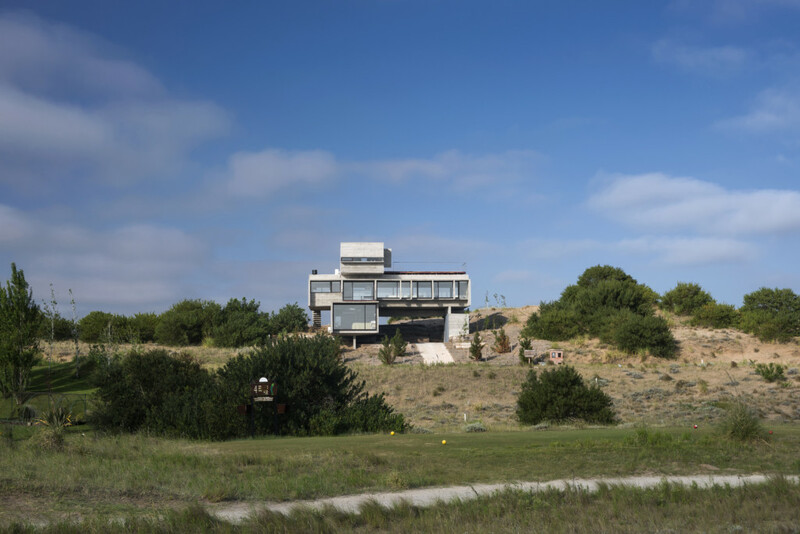 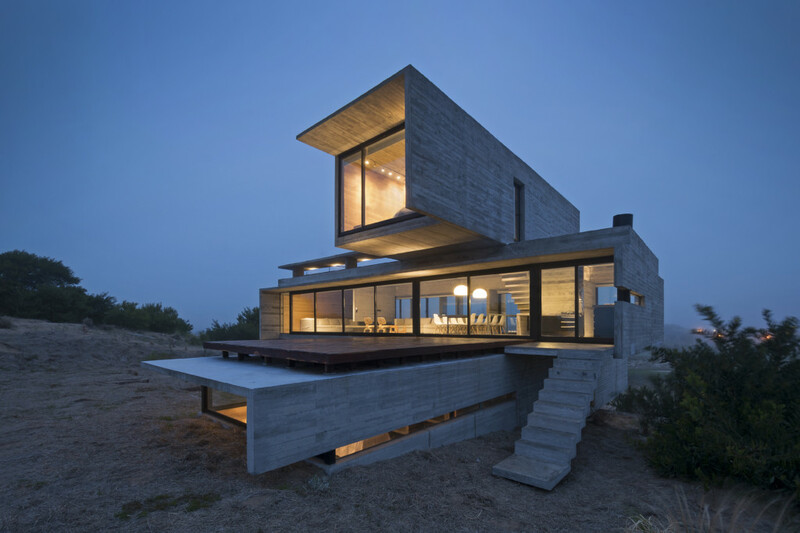 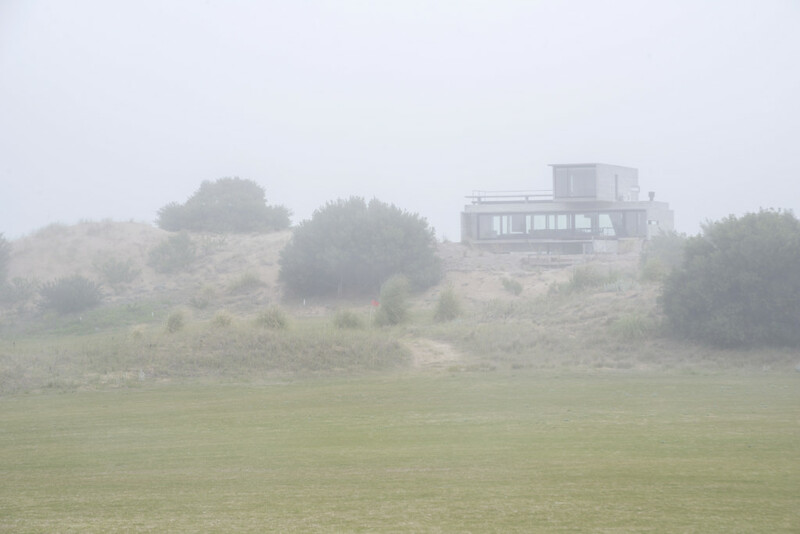 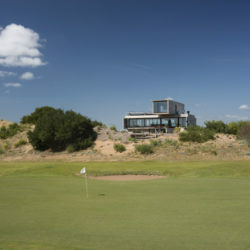 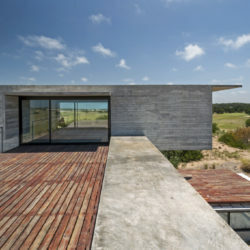 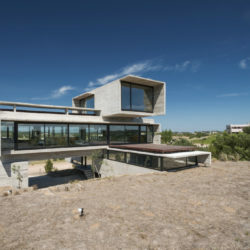 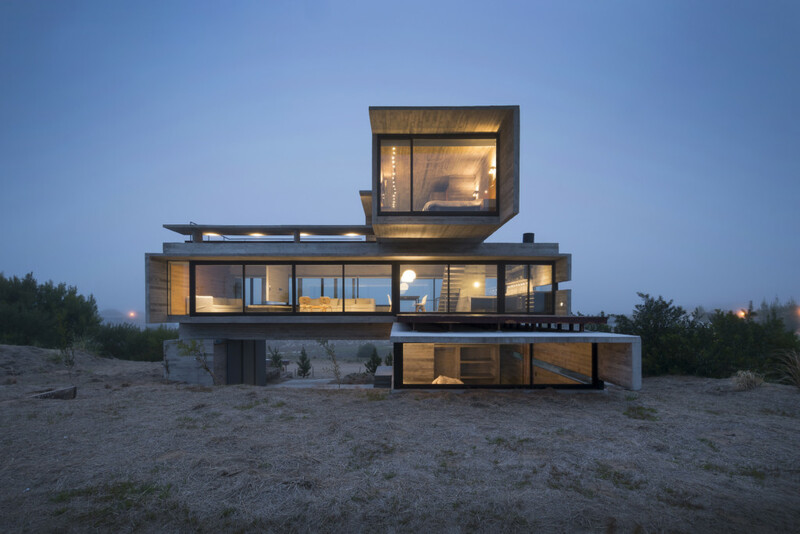 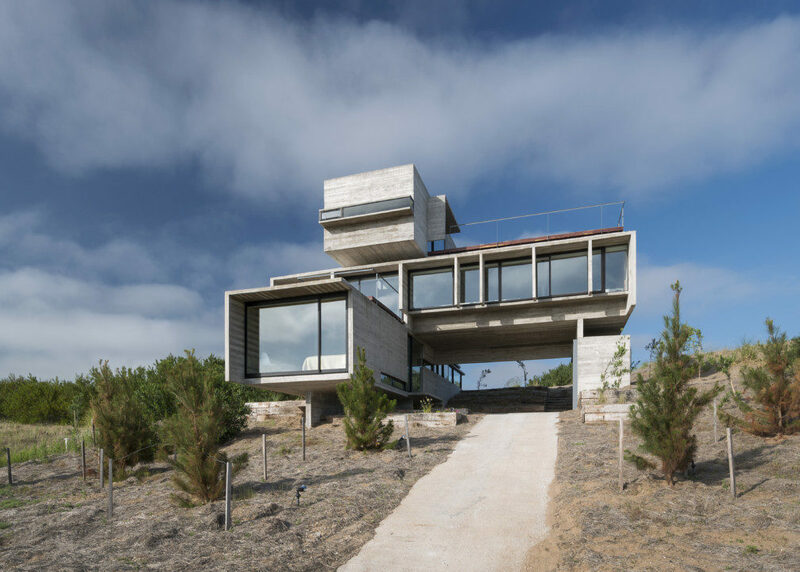 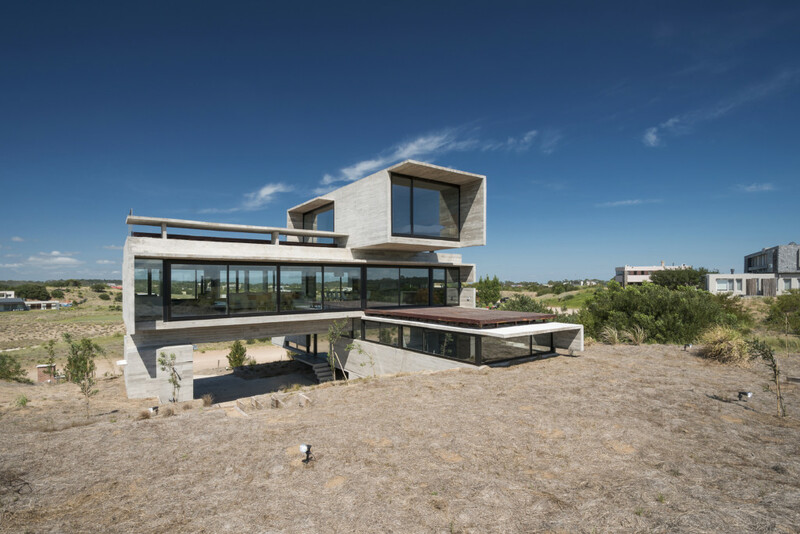 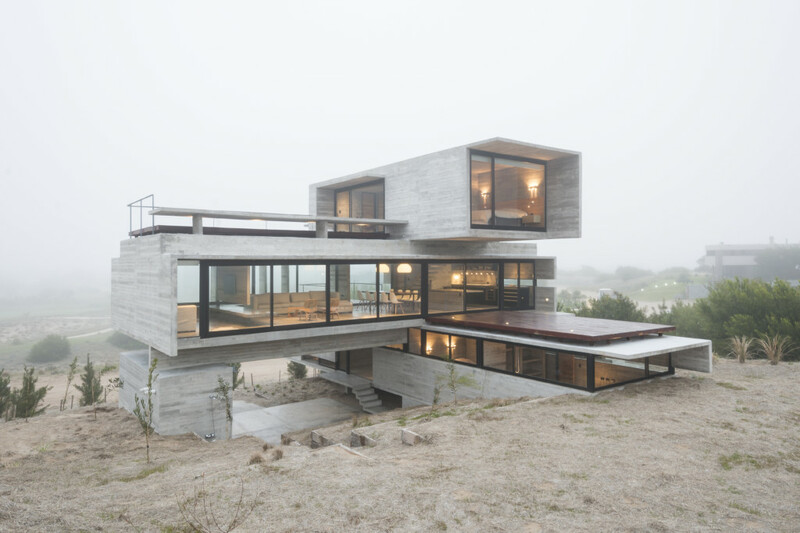 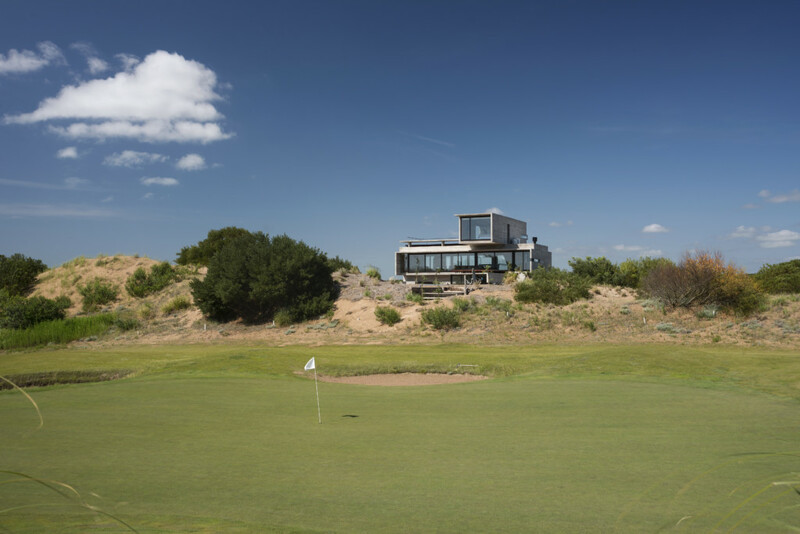 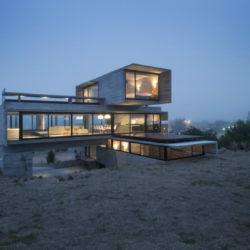 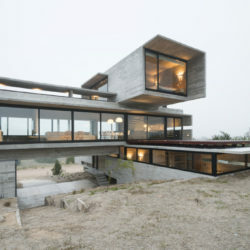 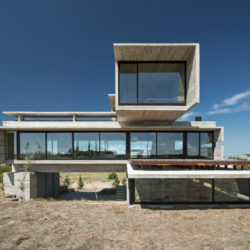 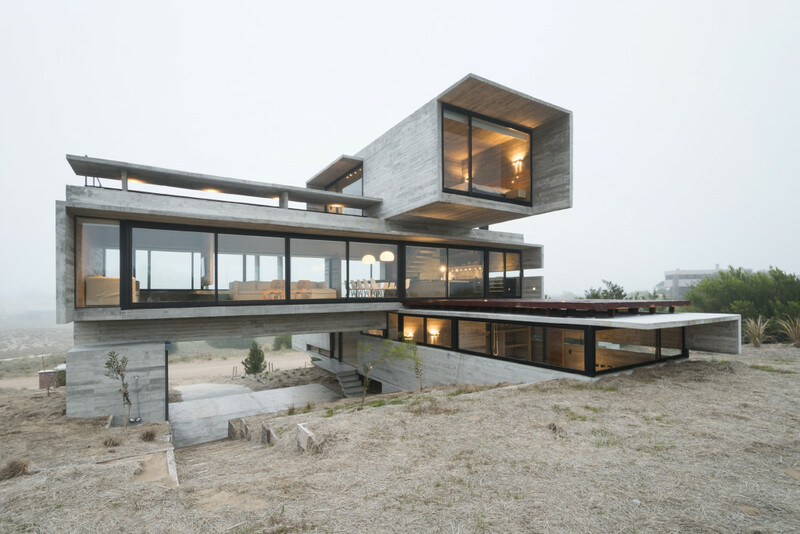 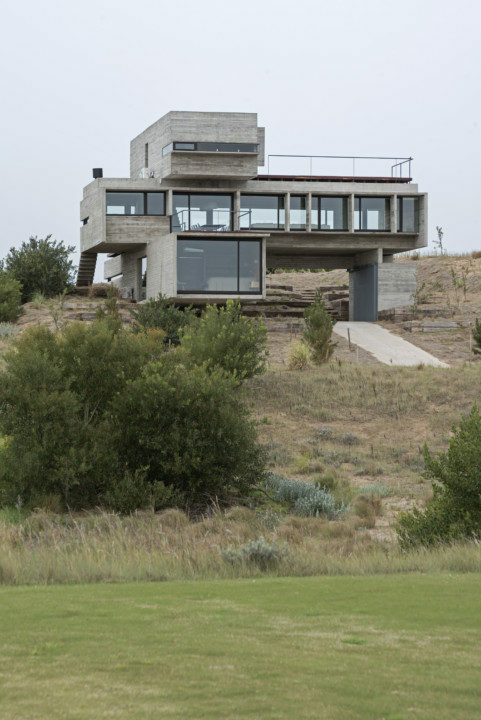 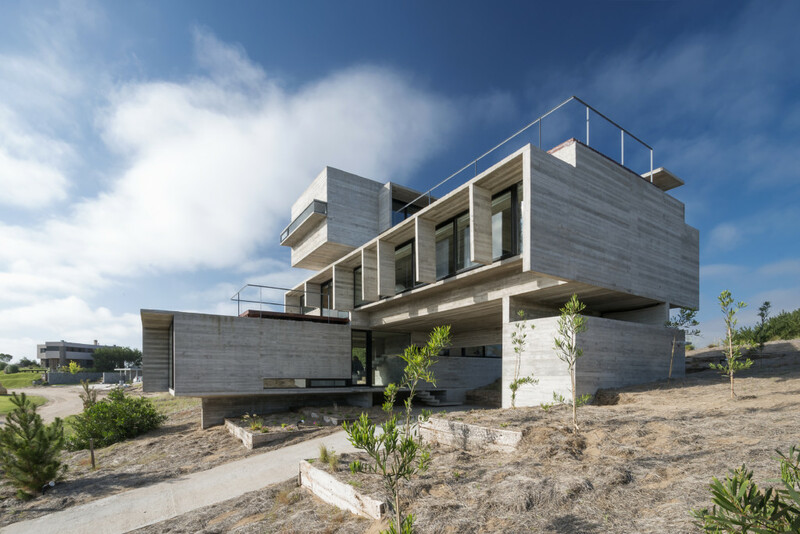 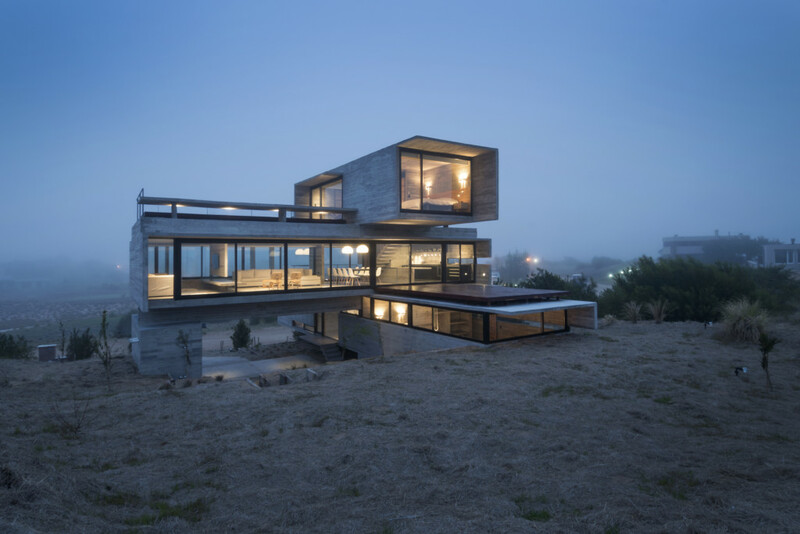 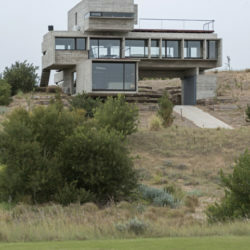 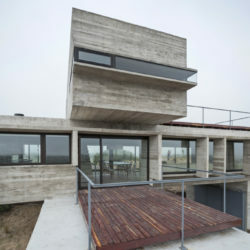 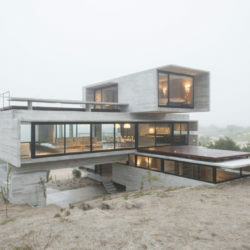 The social prism occupied the maximum building width and rose to the highest level of the dune at the back of the plot of land, thus gaining 180° views over the golf court, open views over the neighborhood, and an appropriate concealment from the street. 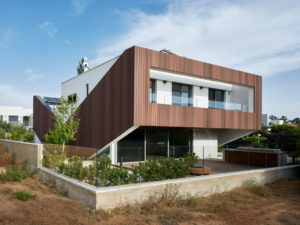 In order to better reinforce the volume’s privacy, it was decided that maritime pines should be planted in the space lying between the building and the road and vertical sunshades be installed, that also reduced the sunlight incidence from the west inside. 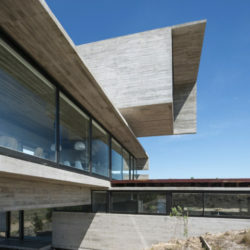 Likewise, the sunlight vertical incidence from the north was controlled by the horizontal eaves —cantilever slabs—, which monolithically joined to vertical partitions work in the same way as the brise-soleils at the front. 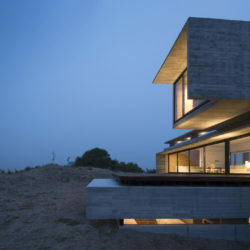 Adequately independent from the rest, the third volume, like a cannon, captures views of the distant sea horizon. 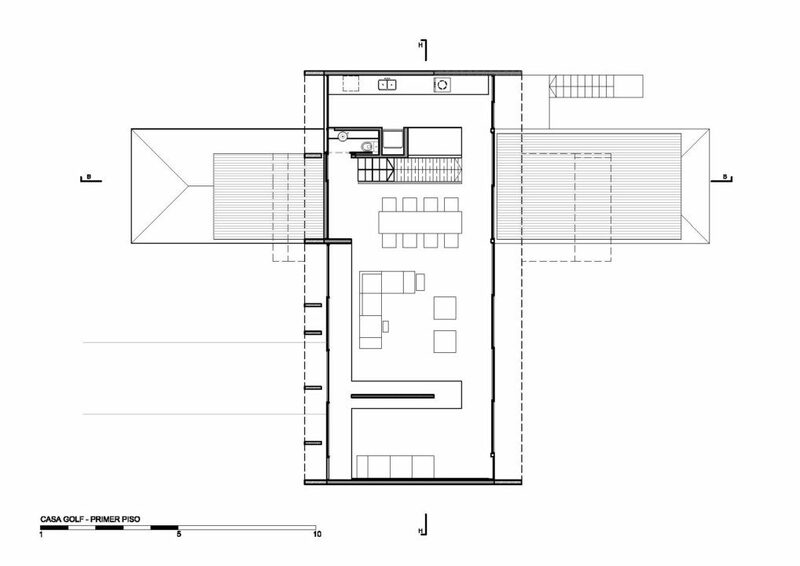 While the social area opens frontwards into a terrace-lookout, a bigger, more private expansion on the other side projects the living room and dining area outwards. 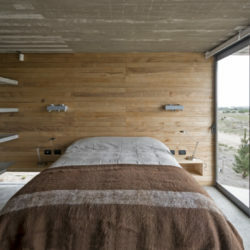 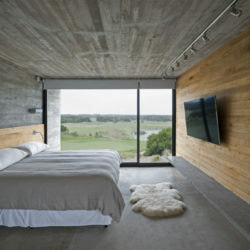 Providing shelter from the sun and the rain, the master bedroom’s volume hangs over most of this expansion. 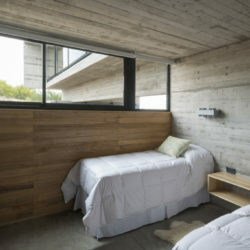 Every deck was built with quebracho wood and contributes to lower the sun incidence over the rooms they lie on through their being slightly detached from the concrete. 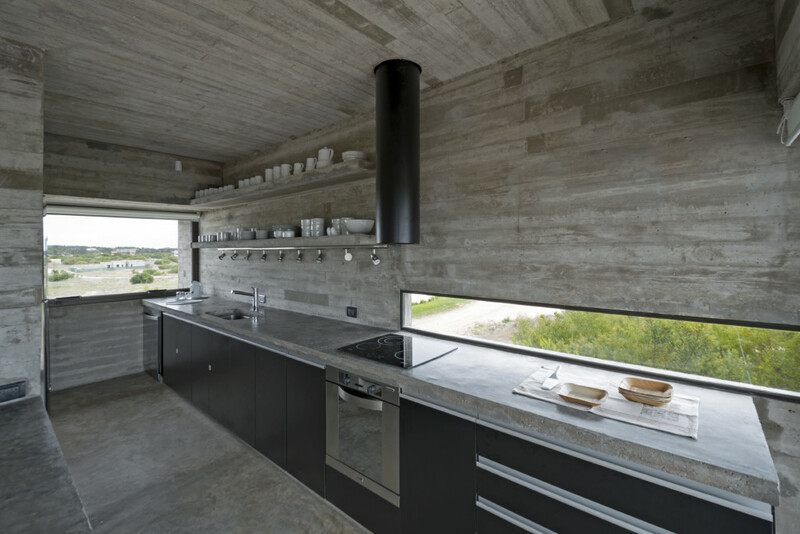 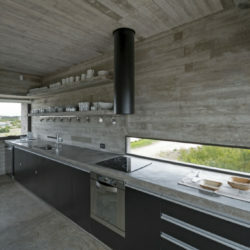 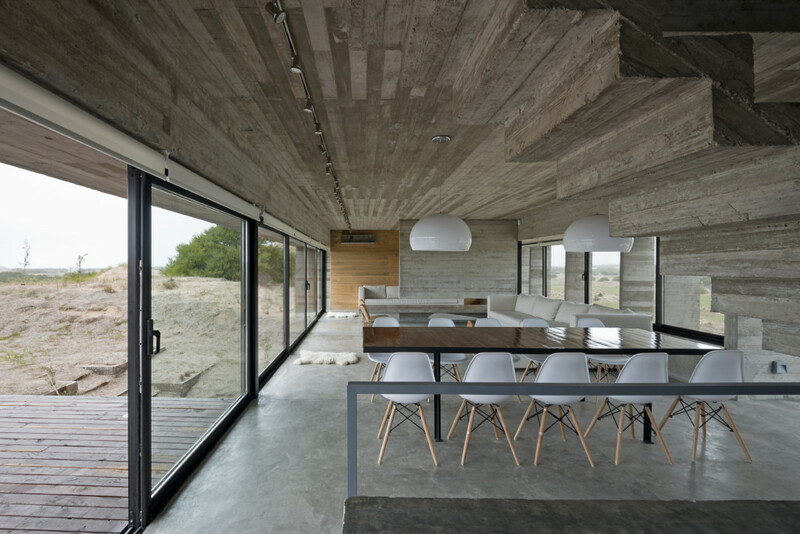 The facing walls less affected by the sun rays (oriented to the southwest) were thermally isolated with an interior coating made of kiri wood. 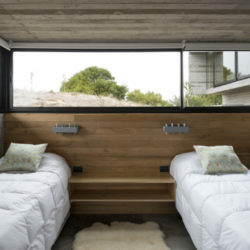 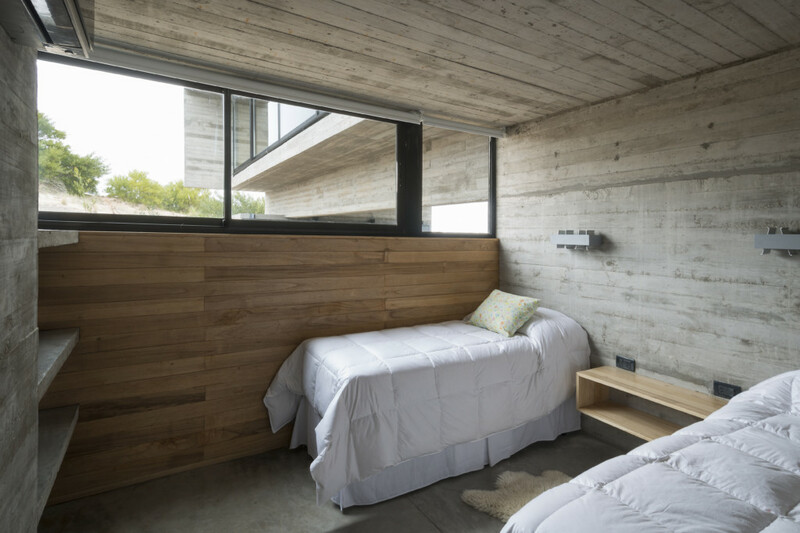 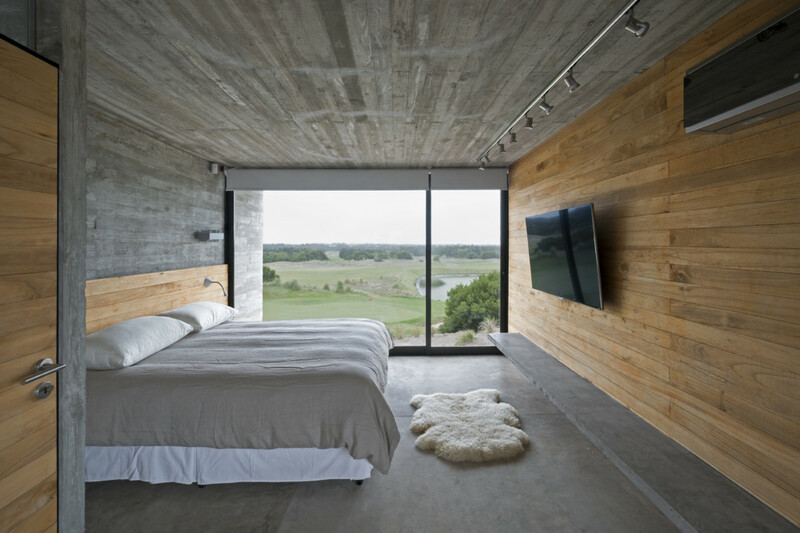 This coating was also used on the partitions that support the backrests of the beds, so that the concrete’s roughness is softened in the most private areas. 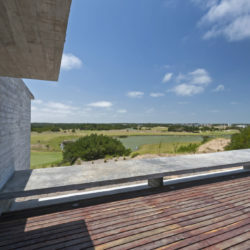 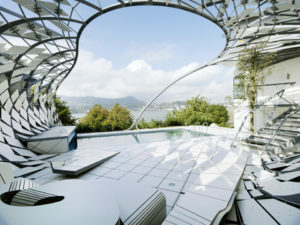 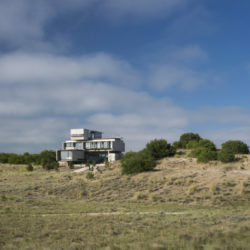 Besides passive sun control provided by the house’s architecture itself, and in order to allow Golf House to be lived in throughout the year as the commissioner requested, Split air conditioners and radiating floors were installed. 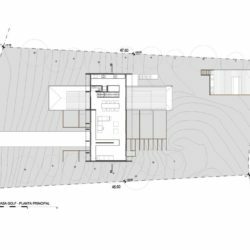 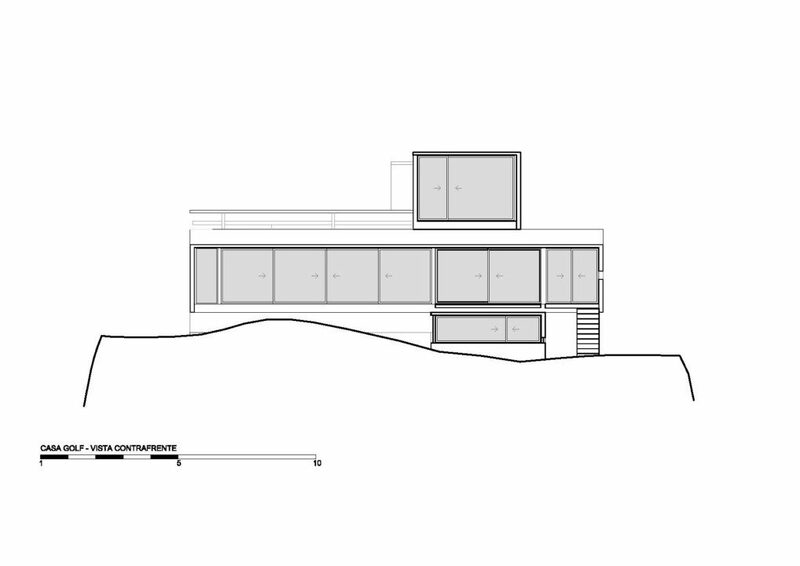 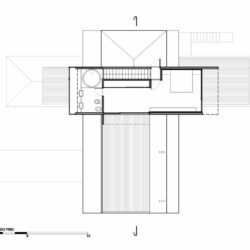 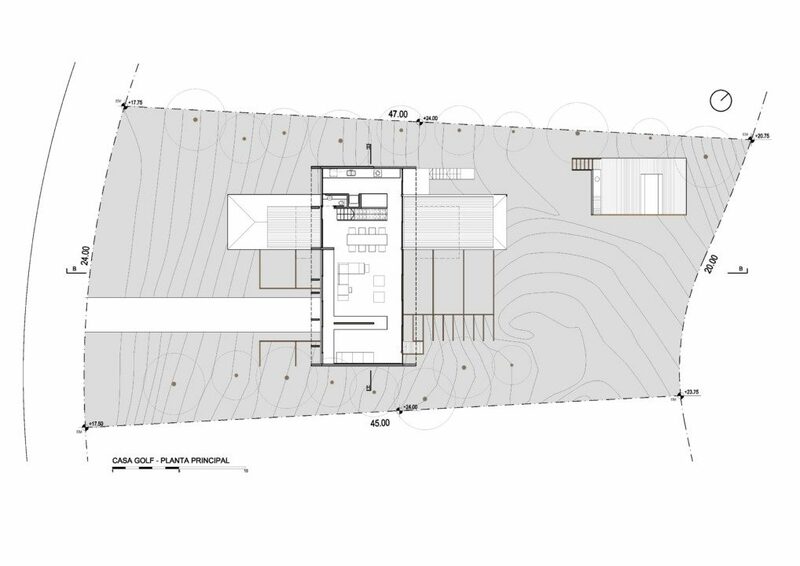 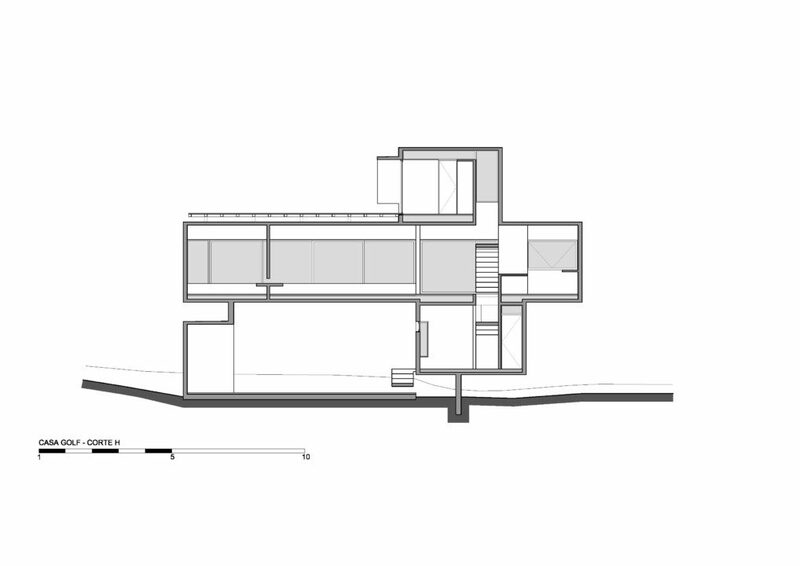 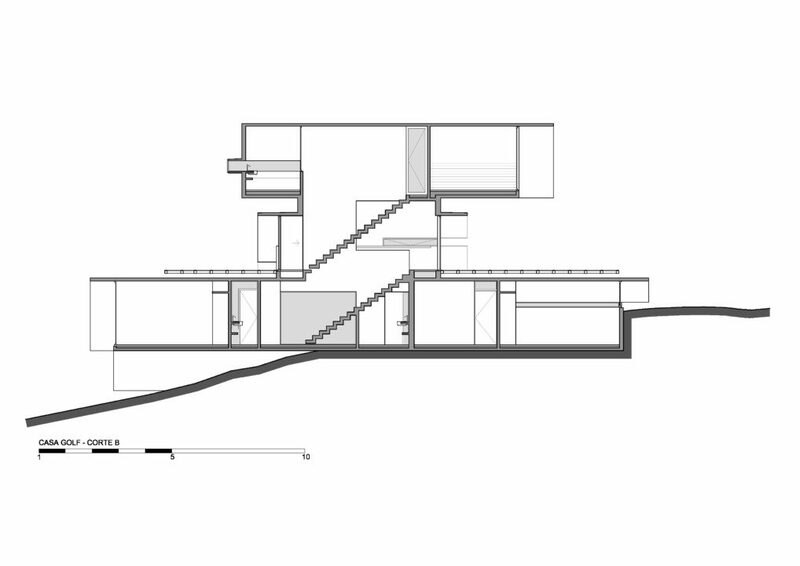 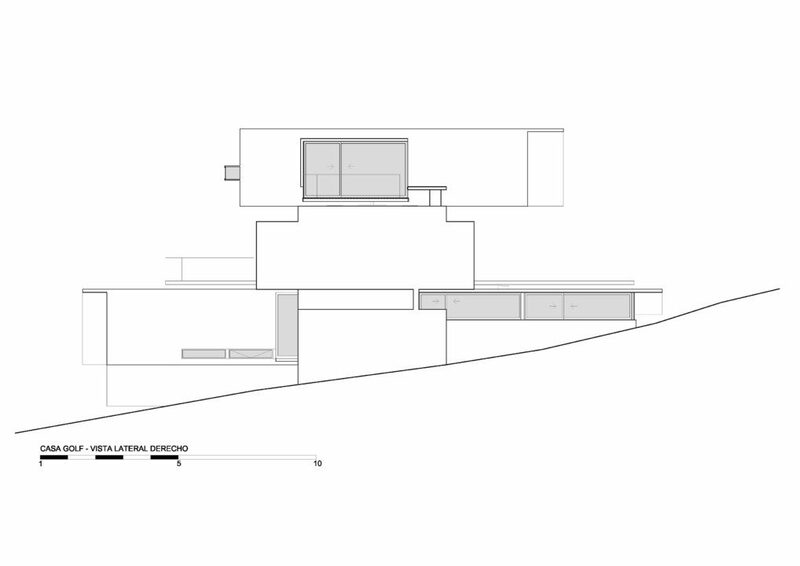 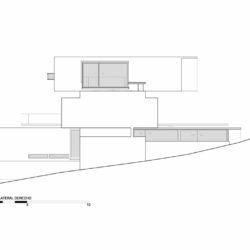 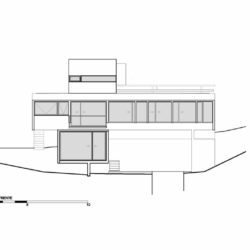 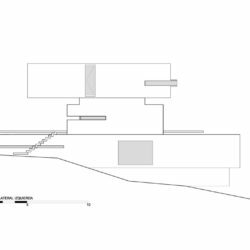 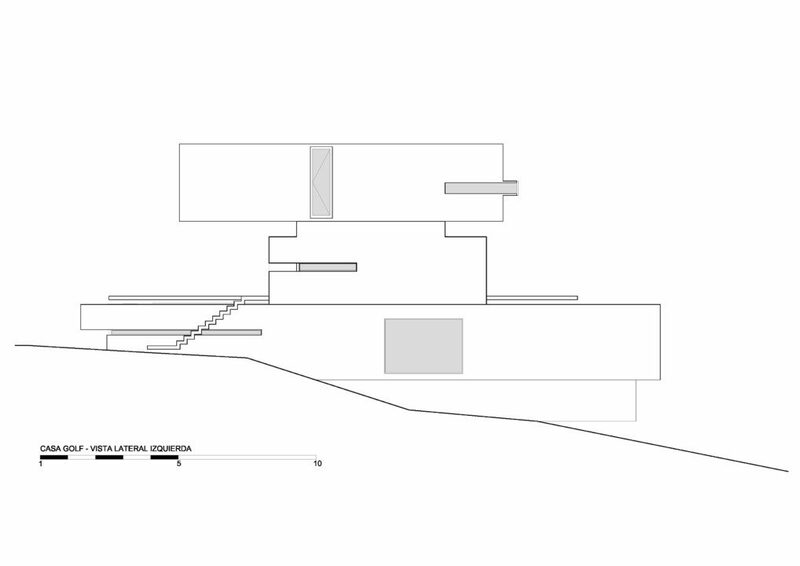 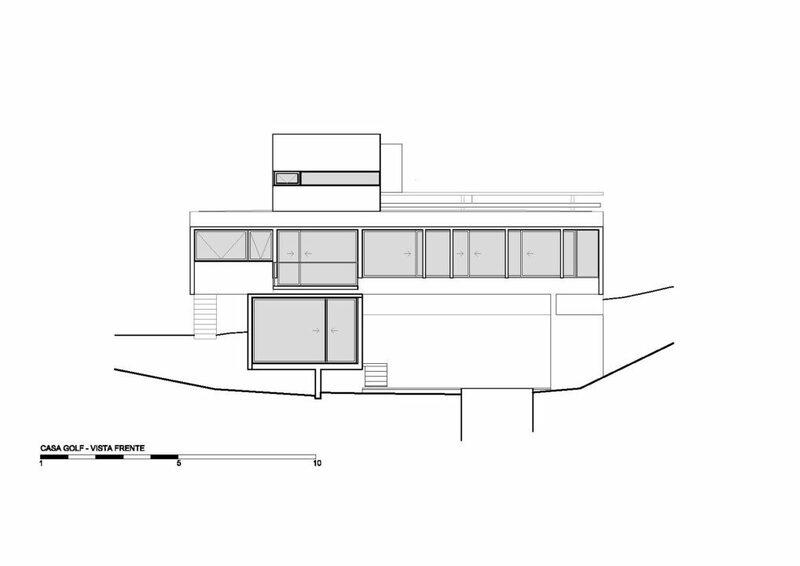 The prisms’ disposition aimed at structuring the house as a lookout-artifact composed of volumes set around an articulating axis: vertical circulation. 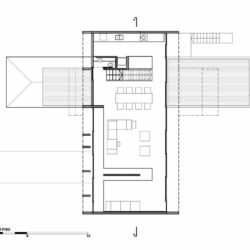 The scope of their overlapping and the partially underground entrance lobby was to lower the height and moderate the visual impact of the whole building. 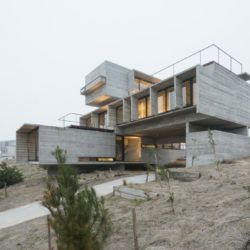 The big spans and the overhangs called for by this volumetric distribution were only possible by means of the employed reinforced concrete’s structural properties.